Former England batsman Kevin Pietersen says he was liked by his team-mates, despite reports saying otherwise. 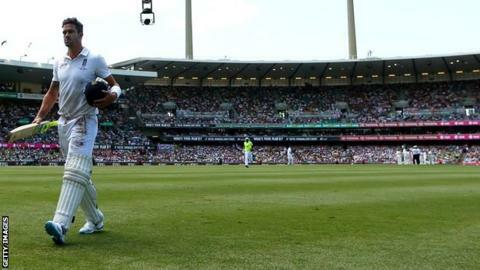 Pietersen was discarded after the 5-0 Ashes defeat in Australia amid claims he had a negative effect. "Contrary to popular belief, I have a very good relationship with most of the guys in the English dressing room," Pietersen told the Times of India. He also said this rapport was why he was the first to spot Jonathan Trott's stress-related problems on tour. Pietersen added: "He has said that I was the first person to notice his problem. "I told him that he needed to calm down and he was putting too much pressure on himself. He is doing quite well now." Pietersen, who is in the sub-continent ahead of the new Indian Premier League tournament, said: "If someone is struggling, I like to go up and put an arm around him." The 33-year-old, who was let go by the England and Wales Cricket Board shortly after the end of the winter Ashes tour in Australia, will begin life after England in the IPL with the Delhi Daredevils on 17 April.